Street art should be seen in the street. Much as I love galleries, I'd suggest taking advantage of the brilliant blue skies and cooler temperatures in Istanbul this weekend to get outdoors and roam the backstreets of Kadıköy for glimpses of some truly spectacular new street art in its natural habitat. 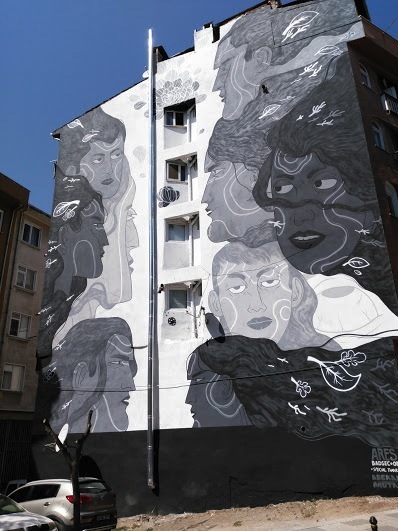 The 5th Istanbul Mural Festival, which ran in Kadıköy from August 17 until September 7, assigned five graffiti artists a bare wall each on which to work their magic. The murals may be situated a bit further afield than hip Moda, but searching for them, and discovering new corners of the neighbourhood along the way, is half the fun. Chu, one of the early pioneers of street art in Buenos Aires, was the big name of this year’s festival. His abstract work in Rasimpaşa, a short walk from up-and-coming Yeldeğirmeni, is a geometric wonder. The half circle on the right side of the building resembles the sun, which is either bursting with vibrant shapes or drawing them in, depending on your perspective. 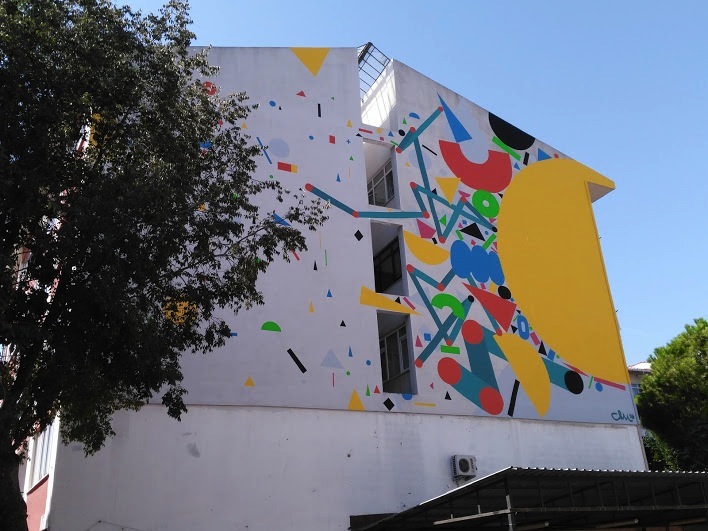 The horizontal movement on the right side of the mural is complemented by the small shapes dropping vertically down the wall’s left side – it’s a universe in motion. A wide spectrum of emotions is on display in this black-and-white beauty by Ares, a street artist from Balıkesir. With expressions ranging from anger to lust, two rows of individuals, one on the right and the other on the left, face each other down. The human heads – gender almost seems an afterthought – are depicted with flowing locks, in contrast to the angular facial features, and turned at slightly different angles. This multi-layered mural is my favourite of the bunch, mainly because the tension between the two sides is almost palpable. 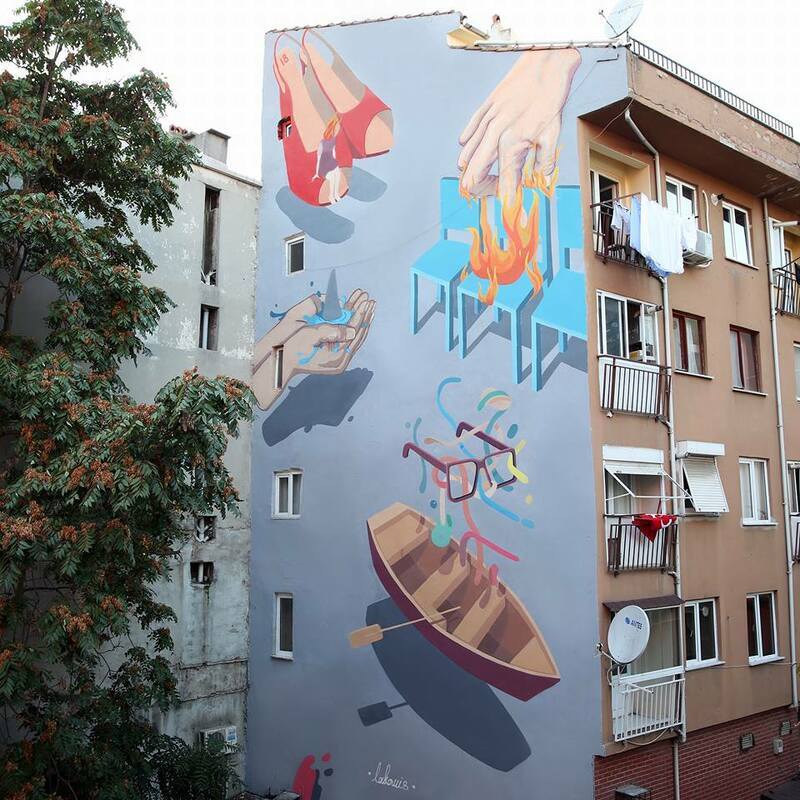 This mural by Lakormis is a stone’s throw from Ares’s work, yet the side-by-side comparison doesn’t do it any favours – while the individual elements showcase the artist’s technical prowess, the piece lacks a unifying theme. My eyes kept darting back to Ares’s piece and its compelling narrative. There is something awe-inspiring, though, about seeing two massive murals on the same street corner. 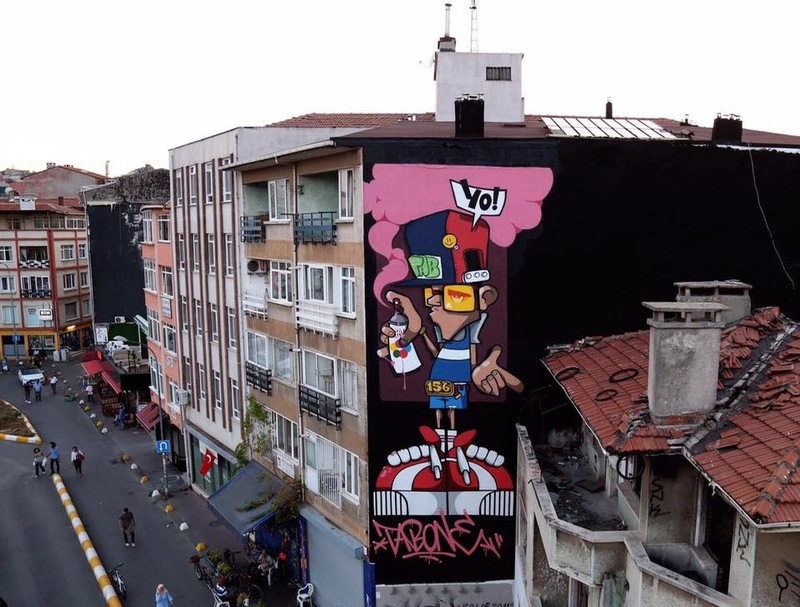 Situated close to the parking lot that formerly served as home to the enormous Salı Pazarı (the weekly 'Tuesday Market'), Tabone’s mural appears to be a self-portrait, as demonstrated by the can of spray paint in his hand and the ‘156’ belt buckle, a reference to the 156 Crew, of which Tabone is a member. There’s nothing particularly innovative about this piece – it comes across as a bit sanitised, especially compared to the street art covering the adjacent abandoned building. But with its vibrant colours and playful composition, the mural is easy on the eyes. One more mural was scheduled to be painted by The Writer Life on a bare wall next to the Kadıköy Youth Centre (Kadıköy Gençlik Merkezi, Nafizbey Sok No. 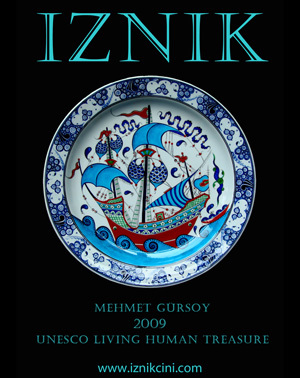 19) in Acıbadem. As of last weekend, it was still a work in progress, but it should be almost finished by now.